Craig and Ainslie had a child with cancer. And they had no idea. The hardest part was coming back home to a silent house. A week earlier, Craig and Ainslie Hutchen’s family home in Adelaide had a squealing, active, playful toddler ruling the roost. Now it was still and empty. Craig and Ainslie have taken part in Road Raise the past few years. It helps with their grief. Post continues after video. 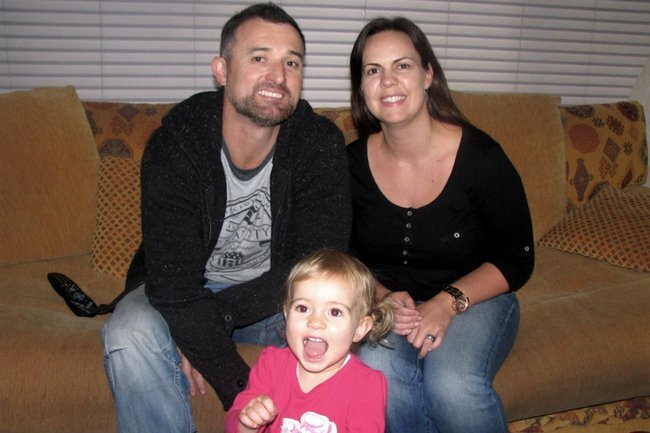 Henley was an IVF baby, and apart from that first little hurdle to fall pregnant, she was an absolute dream child. “I had some morning sickness but that’s about it. My water’s broke on my due date. My labour was fairly easy, I did have to have an emergency c-section. But really, it was a breeze, it all went fine,” Ainslie said. Henley Hutchens was a go-getter. She loved bikes, being outside, being at the playground – she was fun, cheeky and happy. She was also perfectly healthy. Then out of the blue, a few weeks after her second birthday, Henley started vomiting. But it didn’t appear to be serious, she even made it to her swimming lesson that night. Two weeks later on a Friday night, it happened again. She became lethargic and continued vomiting. On the Saturday she improved slightly – enough to squeeze in a trip to the park with dad, but by Sunday she was ill again. Doctors were adamant she just had a gastro virus, and told the Hutchens to ride it out. Henley’s symptoms continued into Monday and Tuesday. “Tuesday night we put her to bed, Craig checked on her at about 12 and said ‘nup don’t like the way she’s breathing.’ We went back to emergency and she never regained consciousness,” Ainslie told Mamamia. Henley Hutchens died from a brain tumour when she was two. Image: supplied. "We like to think, she died in her own bed that night - at home. But she really was kept alive until Friday so they could donate her organs. We take a bit more comfort from thinking she passed away on that Tuesday," said Ainslie. Henley died from a brain tumour aged two years two months. The way the tumour was sitting meant there were absolutely no symptoms. "We started questioning everything we did. &apos;She fell over three months ago, was it that?&apos; But there was nothing we missed," said Ainslie. The couple were told it was just "bad luck." Losing a child is a grief that can&apos;t be explained. But Ainslie says it put them in a state of shock for weeks. "The first major sign was Friday night, and she died by Tuesday night. It was so surreal. "We couldn&apos;t really comprehend it. We kept automatically looking for her, or thinking we had to do something for her," she reflects. Craig and Ainslie spent weeks in a bubble. They fell into each other and stayed by the other&apos;s side through every waking minute of the day. It&apos;s how they got through. When they did re emerge, Ainslie found herself wanting to find something to fill their spare time with. There was a huge void that she desperately needed to fill. So, they looked into volunteering, and found the Leukaemia Foundation. They were asked to join one of the Foundation&apos;s charity rides. Craig loves cycling, and Ainslie makes a solid support crew, so they did, and have been involved ever since. It&apos;s one week of the year, where they get to refill their buckets a little bit. They can remember Henley, and share stories about her with other families who have gone through grief. "It was a big week for both us and it helped a lot with our healing," Ainslie explained. Craig is currently wrapping up a seven day ride to Melbourne called Road Raise, raising money for CanTeen. He arrives today. It&apos;s the first one Ainslie hasn&apos;t joined him for. "It&apos;s a momentous week. There&apos;s so much healing you can do. For me to not be there to share our story, and hear the stories, it&apos;s been tough," she admitted. Ainslie isn&apos;t there, because she has her hands full this year. She&apos;s 20 weeks pregnant, and is running after two-year-old Easton. Easton only just passed the exact age Henley was when she died. "They look very alike," said Ainslie. "But they are very different, Easton loves books and drawing and counting, not so much playgrounds." Ainslie and Craig admit they&apos;ve been pretty over-protective parents since the death of their eldest daughter, but their GP doesn&apos;t hold their regular visits against them. Easton is growing up knowing exactly who her big sister is. In fact, her and her sister&apos;s childcare centre will be throwing a Pirates and Princess party on Henley&apos;s birthday in a few months, to honour her. It&apos;s an annual tradition. Losing Henley so quickly was horrendous. But the Hutchens try to remember that losing her slowly would have been more painful. "We&apos;d rather Craig and I were in pain, then her," Ainslie said. Ainslie herself lost a big sister to SIDS and it was something growing up the family never openly talked about. That&apos;s not something she&apos;s prepared to do with her family. 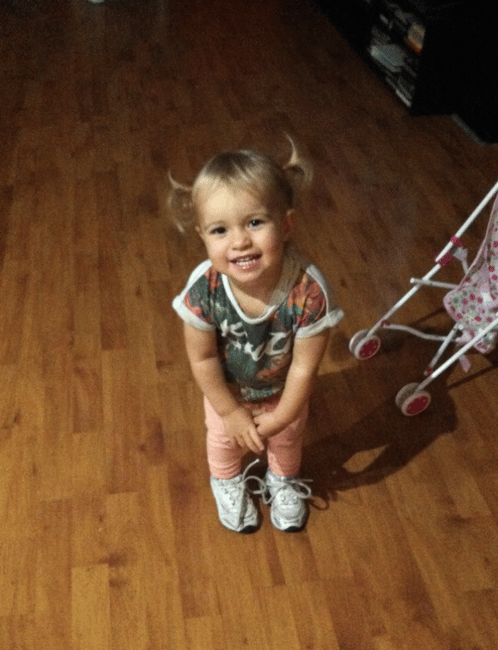 "We were determined she wouldn&apos;t be forgotten," Ainslie told Mamamia.